This month's feature photos come from George Lasecki of Sandusky Michigan who has recently acquired the gem shown above. It is a 1927 Nash Firetruck used by Copper Range at the Champion Mine complex from that year until 1946/47 when it was put into storage. George relates that the body was built by the Seaman Body Company of Milwaukee Wisconsin, body number 6631-23, model 270. Information I have shows that it was housed in a shed near Champion #4 and had 700 feet of hose and a 48 foot ladder. The truck was manned by mine employees. The first photo was taken some time ago when it was still in good shape. George relates that it was keep in storage by Copper Range for some time until it was purchased by a firefighter from Hurontown (you can see the words Hurontown on the hood of the first photo), it blew the motor in 1970. The owner George purchased it from rebuilt the motor and then parked it in 1978. The second photo is one George took this year when this vehicle saw the first light of day since 1978. George is interested in finding any information or photos of this engine during its service at Copper Range. If you have any information please post it on the discussion board for this photo or send me any email. 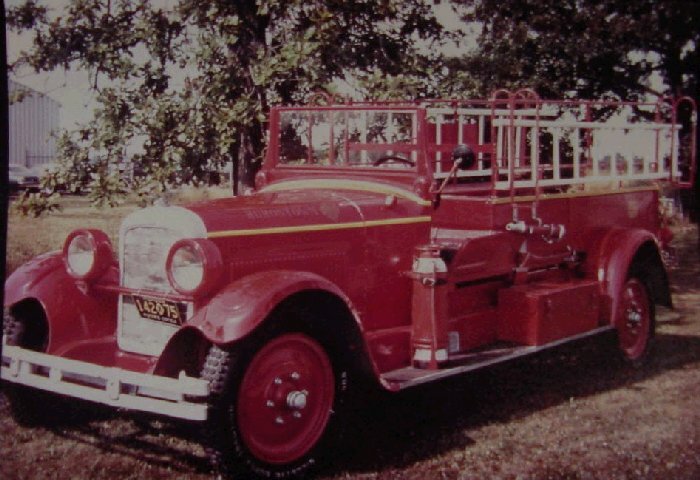 Joan relates: Attached is the picture of the Copper Range Nash fire truck that I had in an album. Date on back of the picture is 1968. The picture was taken next to the Hurontown fire station. 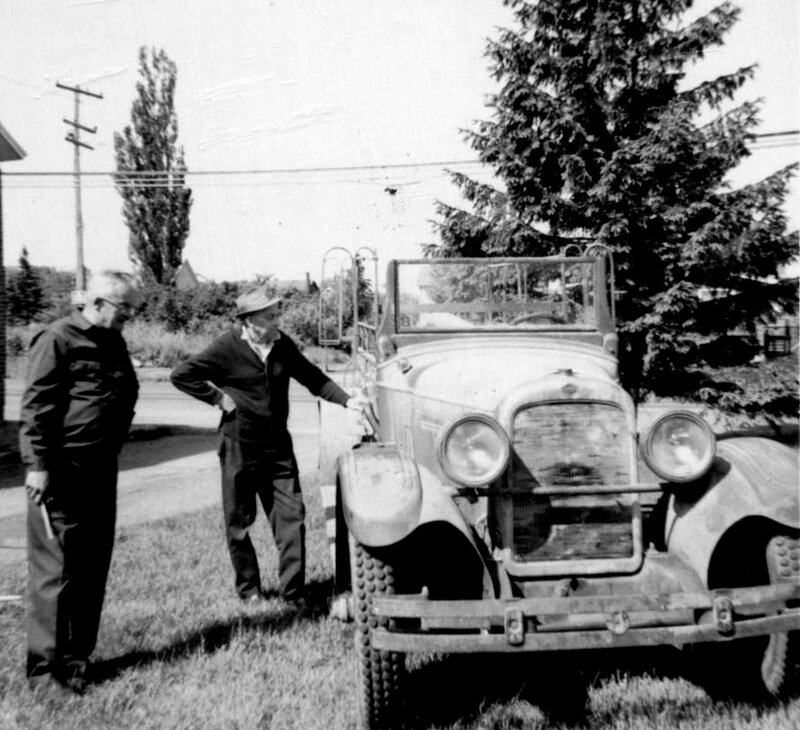 The men in the picture are both firemen L-R: Leonard Shiroda (my father) and August Frike. According to my mother, the fire truck may have had ladders but it was essentially stripped down when they acquired it. The truck was never used to fight fires. However the firemen wives drove it in a parade where it broke down half way through. The Hurontown Fire Dept. reportedly has a picture of truck in the parade. 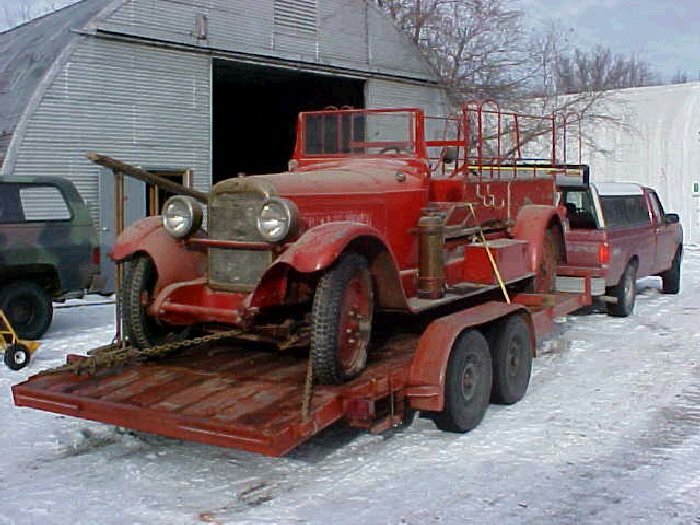 The truck was later sold to a fire equipment salesman who lived in Pickerel, Wisconsin for his private museum.